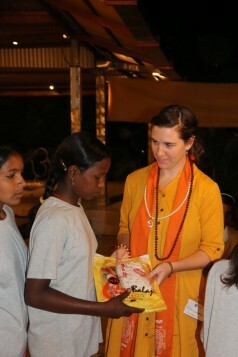 “Serve, Love, Give” is the mandate that pulses through every thought and action at Rikhiapeeth in India, the heart of Satyananda Yoga. Swami Sivananda established this message decades ago, and passed it on to his student Swami Satyananda who also embodied it. He dedicated his life to serving the people around him. He did not offer charity or random giving, he prioritized learning the needs of people and serving based on this. I was lucky enough to visit Swami Satyananda’s ashram (Rikhiapeeth) for the third time last month and experience the power of ‘Serve, Love, Give’. I was there to assist Yoga and Meditation retreats being offered to an international group of students, lead by one of my long-time teachers. Even though my focus was on supporting the retreat participants and management, we were all swept into the inspiration of this message. Seva (selfless service) and Karma Yoga (the Yoga of action) are the primary activities of everyone in the ashram. Day after day, people contribute their skills and time to the various activities. The word ashram is from the word “shram” which means to labour. It is a place of inner and outer work. This year is the 25th anniversary of Swami Satyananda’s arrival at Rikhiapeeth. He had already traveled the world to inspire thousands of people to live a Yogic lifestyle and also established the Bihar School of Yoga in India (the world’s first Yoga University). When he came to Rikhia it was for seclusion and to do his own Spiritual practices – not to build an ashram. But at that time, Rikhia was one of the poorest parts of India and the villagers kept coming to him for support. He realized there was a strong need to serve, love, and give to his new neighbours. Over time this area has been transformed from a region where families did not have enough food each day into a prosperous hopeful area, where people are creative, confident and working towards being self-sufficient. In honour of this 25th anniversary, over the next 15 months the ashram is hosting free events for the locals; arts & crafts workshops for the children, vocational training for graduates, medical camps for everyone, and much more. During my visit I witnessed a 5-day English course for young women and 5-Day medical camps focused on Eye Care, Women’s Health, and Pediatrics. There are constantly positive projects in the ashram to support the local people – too many to write about in this article! My time in the ashram reinforced two messages. One is that Yoga is not just about stretching the muscles, it’s also about stretching your heart and hands out to your neighbours. The other is that ‘Serve, Love, Give’ is a concept not exclusive to Rikhiapeeth in India; it’s one that I aim to carry with me everywhere I go. We can do endless amounts of Yoga and Meditation, but unless we start to help the people around us, inner peace and transformation is meaningless. Helping others doesn’t need to be on a grand scale for it to be effective. It can be the tiniest, simplest act of kindness that can transform your community. We are all in this together.